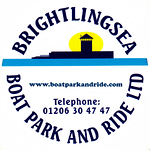 From driving rain and near gales to glorious hot sunshine and lovely sea breezes - what a difference a day made at Brightlingsea Sailing Club's Learning & Skills Solutions Pyefleet Week 2018. The last of the heavy rains went through as the crews gathered for their daily bacon butties and by the time they were launching for the morning session skies were clear, the sun was shining and the forecast west-south-westerly of 14-18 knots was blowing. After the opening day, when only the red group got a race in, it was the blue group first off the line in what proved to be the windier and more spectacular half of the day. The tide was low but had just begun to flood as the boats went afloat and so the race committee took the fleet down the estuary for the start to give greater sea room for the start line. The races are run around permanant laid marks and whilst each fleet has it's own courses, they all use the same turning mark and finish line, which are located immediately in front of the sailing club. The club is located on Brightlingsea's beach hut lined Promenade which makes a natural amphitheater for the creek with people lining the steps and using their beach huts as spectator boxes. With a decent breeze and initially low tide there were plenty of thrills, spills and extremely close racing for the spectators to enjoy. By the start of the afternoon session for red group it was high tide, the wind had dropped considerably and the race committee was able to give the growing audience an extra treat by locating the start line in the entrance to the creek right in front of the Promenade and clubhouse. First off in the morning session were the Fast Handicap fleet where Dave Conlon and Ed Gibbons put in a pitch perfect performance in their RS800 to beat Chris Bannister sailing a beautiful varnished Contender. Third place went to the Sprint 15 of Simon and Leah Clarke. Leah was particularly delighted with their result as, while Simon is an old hand at top level competition, Leah only really started sailing on holiday earlier this year. In the Laser fleet Steve Williams got the upper hand in the standards with Richard Herbert second and Mark Schofield third, while Alex Clarke took victory in the radials from Alex Lightly and Brooke Hastings. Both fleets start together and are also scored as a handicap fleet, and in the combined results the winner was Steve Williams with Alex Clarke second and Richard Herbert third. In the Medium Handicap the visitors got the better of the locals as Ben Powell from Alton Water SC sailed his RS Aero 7 to victory over the Scorpion of Simon and Fiona Gillow from Chipstead SC. 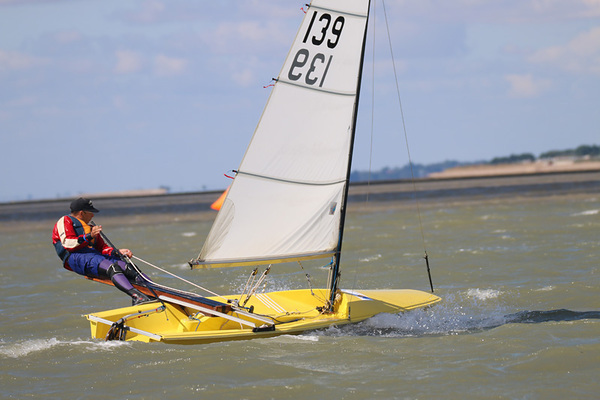 First Brightlingsea boat was Will Taylor's RS Aero 7. 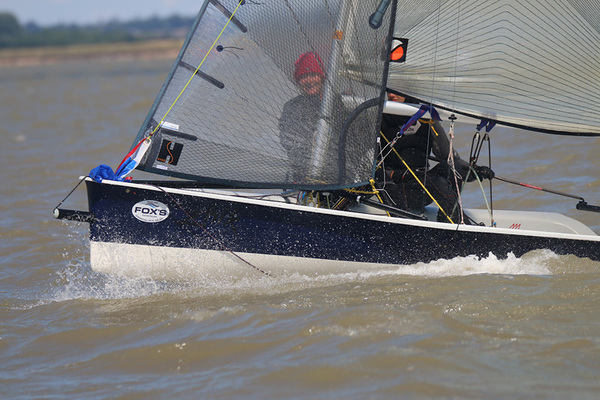 Another visitor, Felix Powell from Alton Water SC, won the Slow Handicap fleet sailing an RS Tera Pro with the Topper of Elizabeth Hill second and the Topaz Race of Benjamin Pearson third. After lunch, it was the turn of the red fleet who went afloat for their second race of the series. The wind was lighter for the afternoon session, becoming extremely shifty and variable with an awkward slop left over after the recent heavy winds. The change of pace brought some new names to the top of the Cadet Handicap Fleet where race two was won by Oscar Oldfield and Tom Philips racing an RS Feva XL. Fresh from his third place in the Slow Handicap before lunch, Benjamin Pearson did one better in his Topaz Race to take second place. 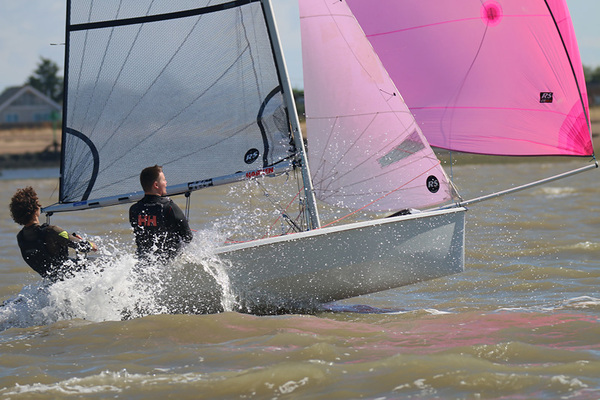 The most consistent performers of the Cadet Handicap so far though are Francis Hartgrove sailing a Laser 4.7, who added a third place today to yesterday's fourth, and Harry McTiernan in an RS Tera Sport who finished third yesterday and fourth today. These two now lead the fleet on seven points apiece with Oldfield/Philips in joint third place with Optimist sailor Katy Jenkins from Bourmoor SC, both counting 9 points. Pyefleet Week has always had a strong family element to it and the Parent and Child Fleet (in which younger cadets are encouraged to race with a parent/relation/family friend) is a wonderful introduction to racing for many of the youngsters. Today it was Dave Youngs and his grandson Finlay Appleton who headed the fleet in a Topaz Race. Enzo Goodsell helmed his mother Nicola Henderson to second place in an RS Feva XL with Stephen Cross and his daughter Morgan taking third in a 2000. Yesterday's strong winds had seen a number of retirements in the fleet including Youngs/Appleton and Goodsell/Henderson. Team Cross now lead the fleet by four points from father and son David and James Herbert who count a 1, 5 scoreline. For James today's fifth place was a huge personal achievement as he fell over just after yesterday's race causing nasty cuts and bruises to his face and some damage to his teeth. This morning father Dave didn't think they'd race, but James had no intention of giving up that easily and so off they went - a decision which clearly paid off as it puts them into second overall. Pete Purkiss took his second race victory in the RS700 fleet with Dave Bridle taking another second place. Richard Goldklang beat Simon Redfearn for third, but as Richard was forced to retire yesterday following a nasty capsize and gear failure, Simon moves up into third place overall, three points behind Bridle and two ahead of Goldklang. The lighter conditions meant that the delightful Wivenhoe One Designs were back up to their full strength of six entries. Nic Blower and Micah Dougal sailed extremely well to take a tricky race from Nigel Cook and Julie-Anne White with Rob Maloney and Matt Belcher third. In the overall standings Blower and Maloney now jointly top the leader board on four points apiece with Cook fighting with George Brown and Peter Goldsmith for third place on six points apiece. The design might be 81 years young, but the competition in the Brightlingsea One Design fleet is as fresh as ever. The twenty strong fleet made a spectacular sight off the start line with their elegant lines and majestic rigs, which were specifically designed for racing in the local tidal creeks and estuary, towering above the other competitors. The boats revel in tricky light airs and the race was to be a battle royal with constant place changes on every leg of the course. Clive Goodwin, crewed by Derick Gentry and Mark Schofield in C4 Cormorant which was built in the late 1920s and fully restored in 2014 by Clive's father Malcolm Goodwin, sailed incredibly well to hold first place the entire way round the course. There were plenty of challengers but none of them could quite break his strangle hold. After a final neck and neck close reach up Brightlingsea Creek to the finish line second place went to Piers Lambert, Dave Conlon and Sarah Bines sailing C9 Bidi. In third place was Phil Rust in C16 Dulcet. Overall Goodwin and Lambert now hold four points apiece with Chris Matthews sailing C27 Rebel with Ed Gibbons and Millie Newman just one point back in third. Ashore it was Family Fun Day with magic shows, juggling, tricks and games for the kids throughout the afternoon. Brightlingsea Sailing Club is run entirely voluntarily by the members and this evening it was the turn of the cadet parents to create a delicious Mac "N" Cheese supper which proved extremely popular, after which everyone danced the night away to a family disco and karaoke. The regatta continues until Friday with a change of pace on Wednesday. In the morning the blue group will sail their missed race and in the afternoon the massed fleets come together for the Big Wednesday All In Handicap which starts at 3pm. Post racing there will be a special Big Wednesday Prize Giving followed by a Caribbean beach party and BBQ with dancing to a steel band. The forecast is for more sun and balmy summer breezes so the champagne sailing looks set to continue. 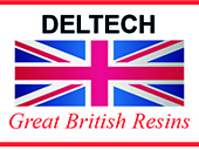 Click the results link above for full results.